While in New York, I had a chance to stop by the Cynthia Rowley boutique to catch up with the team, preview the fall collection (how cool is this two-piece set?!) and do a little bit of shopping. The first piece I tried on and the item I left with was this multi-stripe mesh midi skirt. Isn’t it festive? I’ve already gotten so many compliments – it’s definitely a scene-stealer! While I’m excited to wear it all summer, I think it’ll be really useful throughout fall with a variety of tops, sweaters and jackets. When wearing a piece this outstanding (and outrageous! ), it’s best to keep of the rest of the look somewhat subtle. For me, that translates to a whole lot of black. Here I’ve paired it with a basic top from ASOS and my favorite funky Prada platforms from a few years back. Some other fabulous pieces I’m eyeing at Cynthia Rowley include this hawaiian-print top and skirt (love a good print-on-print ensemble), this embellished denim jumpsuit and this pineapple tee. I kinda wish I surfed so I could sport this colorful wetsuit. Click here to shop all new arrivals! You look so adorable! Such a fun skirt. Love your sunglasses too! What a fun skirt, love these platform sandals. What a fun piece to add to your wardrobe! That skirt is gorgeous! It looks great with the platform sandals. the shoes, the skirt, the bag, the SUNGLASSES…absolute perfection merritt! What a fun skirt! Love the colors… lets you pair it with many top options!! Lovely rainbow skirt, you look beautiful! that skirt is the coolest and I love your hair like this. Happy Friday!!! Your skirt is SO fun!!! Love your hair pulled back half up ;) Enjoy your weekend! Stunning!!! 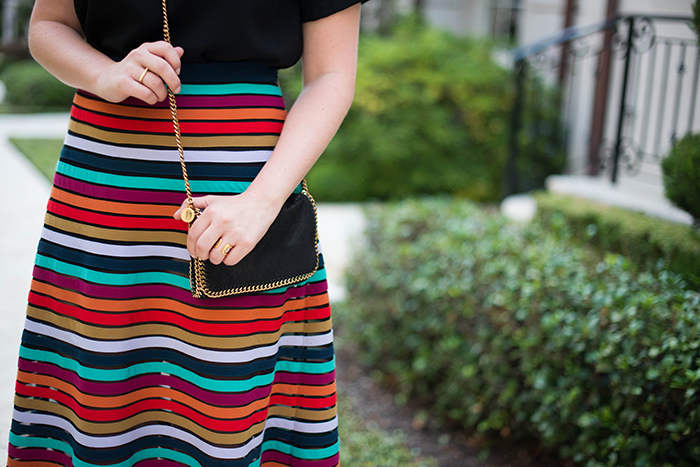 Need that skirt in my life – the stripes & color are stellar! Happy Friday! Oh goodness – I LOVE, love those heels! That skirt is precious I love all the colors and especially love that it’s striped! That skirt is so fun! I love the sheer detailing in it! And those glasses are amazing! Ah this is so fun! Loving the fun stripes! Loving the hair pulled back with those super chic sunnies! I’m such a sucker for midi skirts. Love it in stripes! You look so amazing in classic, feminine skirts. Absolutely love your skirt! It is so cute!